Many halal steaks carry with them a certain tragedy. 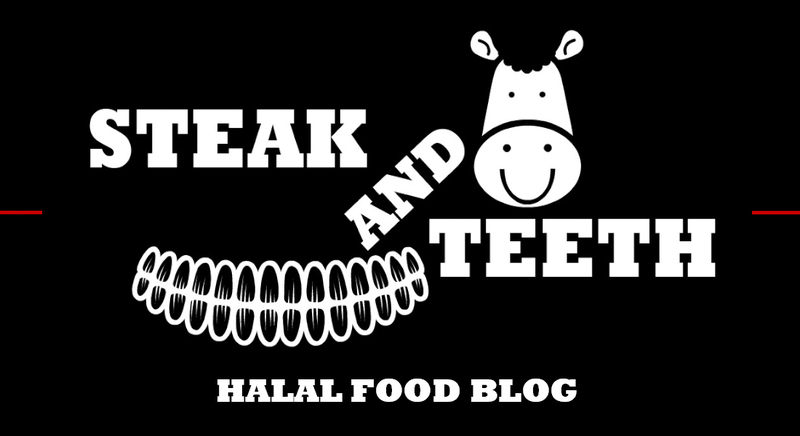 In halal steakhouses across the country (especially those with an Asian chef), patrons order a rare or medium-rare steak, and eagerly anticipate a delicious slab of tender pink meat. Instead, they are greeted by the dark brown sight of ruin – the well-done sight of reinforced rubber, a sight that could make even the sternest of steak lovers weep in silent heartbreak. For those of us who understand the beauty of rare and medium-rare, obtaining an ideally cooked steak can be quite problematic. Steak and Co attempt to get around this problem by handing over the responsibility of the cooking (and the accompanying blame) over to you. A sort of IKEA-style steakhouse, Steak and Co serve fresh rare steaks on a hot plate for you to cook to your liking, alongside your choice of butter, seasoning and sauce. An idea which is both interesting and slightly annoying – as you only have your own “cooking” to complain about. 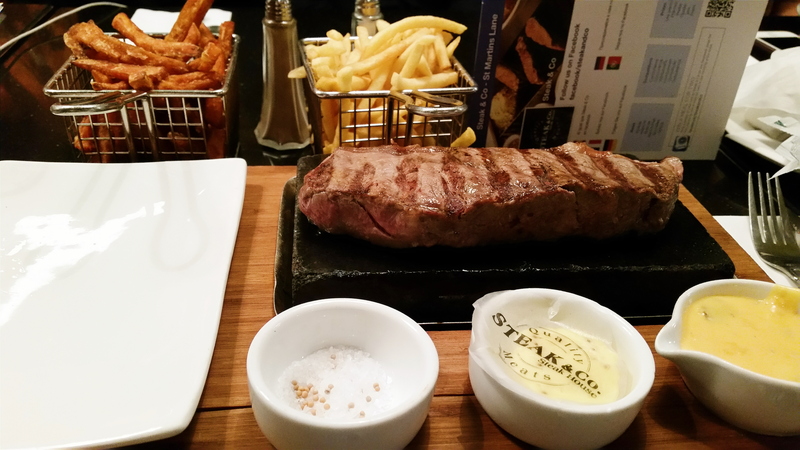 Steak and Co serve a single halal sirloin steak of various sizes. Their chicken is also halal, though certain chicken dishes contain non-halal ingredients which can be omitted. Most of the sauces also contain alcohol, though a few non-alcohol sauces are available, so please clarify if the staff do not inform you themselves. Halal dishes are cooked separately, and alcohol is served. Please clarify these details yourself when visiting as variation between branches may exist. Steak and Co was the destination for Skater Boy’s 21st birthday, and our group was eager to feast on a cow each. Well maybe not the vegetarians who were with us. I highly commend their bravery for coming to sit inside a steakhouse. They’re as badass as the chicken who walked into Nando’s. My order included a medium-rare 10 oz halal sirloin steak with sweet potato fries, alongside mustard butter, mustard shake, and no sauce as none of them appealed to me, (and most of them weren’t halal). However, they gave me a non-alcohol containing sauce anyway, the flavour of which I cannot remember as it remained largely ignored. I generally tend to prefer the taste of a (seasoned) steak itself and that of it’s own juices, as opposed to the result obtained from drowning it in a bath of sauce. The steaks arrived on a hot plate, rare, sizzling, and ready to be cooked to our desire. The waitress advised us to take the steaks off the hot plate and cook it slice by slice to our preference, using the accompanying butter, salt and shake to create our own flavours. I’ve never been to a Build-A-Bear workshop, but I imagine this is pretty similar. (Except you don’t usually eat the bear at the end). Rare and ready to go, the DIY hotplate. 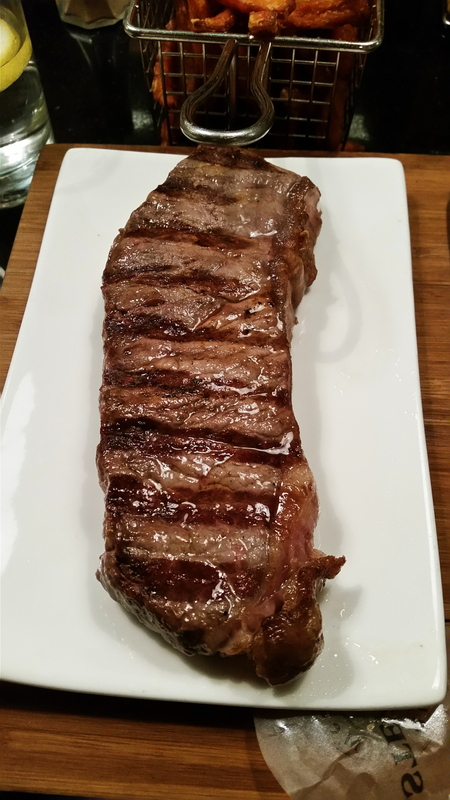 The sirloin steak was of a fair quality, fairly moist and fairly soft and tender when cooked to medium-rare or left at rare. The stock steak wasn’t particularly well-seasoned, but this is presumably part of the “cook-it-yourself” style whereby you season it to your liking. The mustard butter was thick in consistency and the mustard component was mild in nature, whilst the mustard shake consisted predominantly of salt with a handful of mustard grains thrown into the mix. When cooked together, the mustard butter soaked into the meat and provided a rich background flavour. Meanwhile, the bare, unflavoured steak possessed a strong beefy essence and a slight, sharp tang from the juices within. 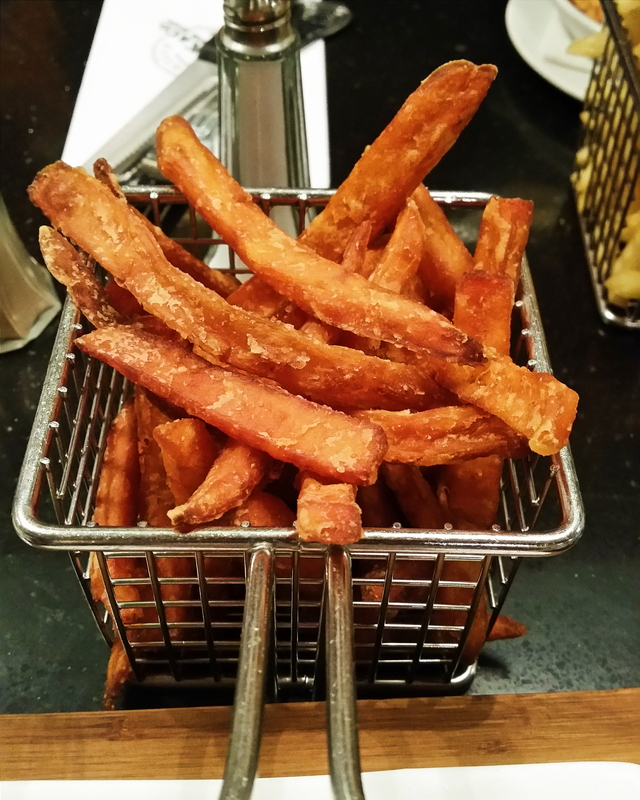 The accompanying sweet potato fries were of a fairly high quality, had a crispy, well-seasoned skin and were soft and smooth within. A few people chose alternative options to steak for their meal, including Fishwonger and Chewbacca, who opted for a chicken skewer, which I had the opportunity to try out. Sadly, the chicken was of an average quality, incredibly bland and poorly seasoned. Whilst overall, the steak was pleasant, it wasn’t particularly exciting to the palate, even when combined with various flavours and cooked to various degrees. There was definitely a missing element somewhere in the mix, and as a result, the only really interesting aspect of my meal was the DIY-hotplate itself. That and the class-hobo repeatedly knocking his head on the overhanging lamps. My halal sirloin steak cost £23.25, and the sweet potato fries £3.50. Mains generally range from £12-£16, starters from £4-£5, and sides £2.50-£3. Given the location, prices are fairly reasonable, as is the quality of the steaks (in relation to the price). However, some of the alternative dishes are rather overpriced both in terms of portion-size and for what they are. 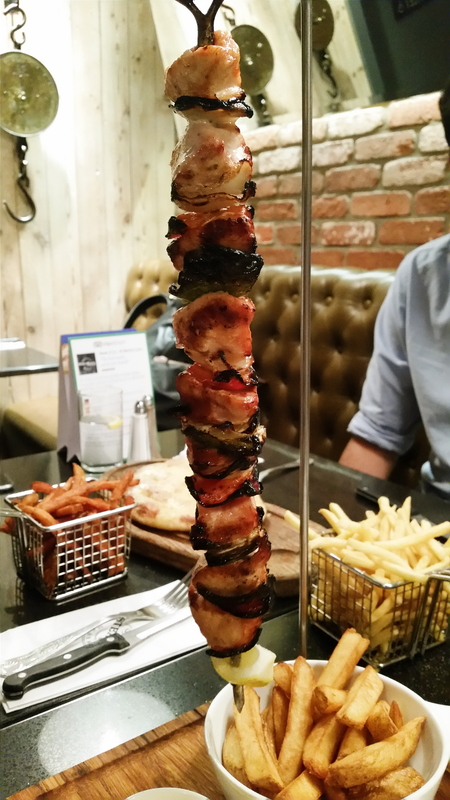 The chicken skewer for example, would set you back £12.95 for a fairly small helping of bland and unspectacular chicken. Still, perhaps the bigger question is why you would order chicken at a steakhouse in the first place. Our waitress was incredibly friendly and helpful as soon as we walked into the restaurant. However, service overall was incredibly slow and painful. We were kept waiting for well over an hour before our food was served and I’m not particularly sure why, given the fact that all the steaks were to be served rare anyway. I can only blame the vegetarians who ordered vegetarian dishes from the menu. Clearly, none of the kitchen staff anticipated anyone would actually order something vegetarian and had to run around in panic trying to source ingredients from the shrubbery that surrounds Leicester Square. Even obtaining the bill was a lengthy affair. Aside from a lack of urgency, staff are otherwise friendly and pleasant. The Leicester Square branch employs a semi-modern steakhouse look, with comfortable leather seating (might as well make the most of the cows), and wooden furniture, large overhanging lamps (which provide much amusement if one of your dining companions is tall and slightly slow), dark wooden flooring, and a number of interesting decorative pieces, including meat-scales. Handy if you want to measure the weight of your vegetarian friends to estimate how much you could sell them to the steak chef for. Perhaps the only area of concern with the venue is the two-seat table that sits immediately next to the door of the washroom. I felt nothing but utmost sympathy for the poor couple that dined there during our visit. If it was a first date, there’s no doubt that it probably went down the toilet. (Sorry). Steak and Co possesses a fairly bustling and lively atmosphere, rendering it easy to blend into and relax in your own space. The other patrons also amusingly began singing “happy birthday” along with us as the birthday cake was brought out, before tapering out as they realised they didn’t know the name that would go at the end. To be fair, I almost always forget the person’s name by the end of the song. A giant cake on fire is pretty damn distracting if you ask me. On a novel backdrop of DIY, inspired by the likes of IKEA, Homebase and B&Q, Steak and Co provides fairly reasonable steaks for a fairly reasonable price. However, whilst your wallet won’t be as broken as it would be at more premium steak vendors, you may find yourself wondering if a broken wallet for a more exciting steak would in fact have been more worthwhile. 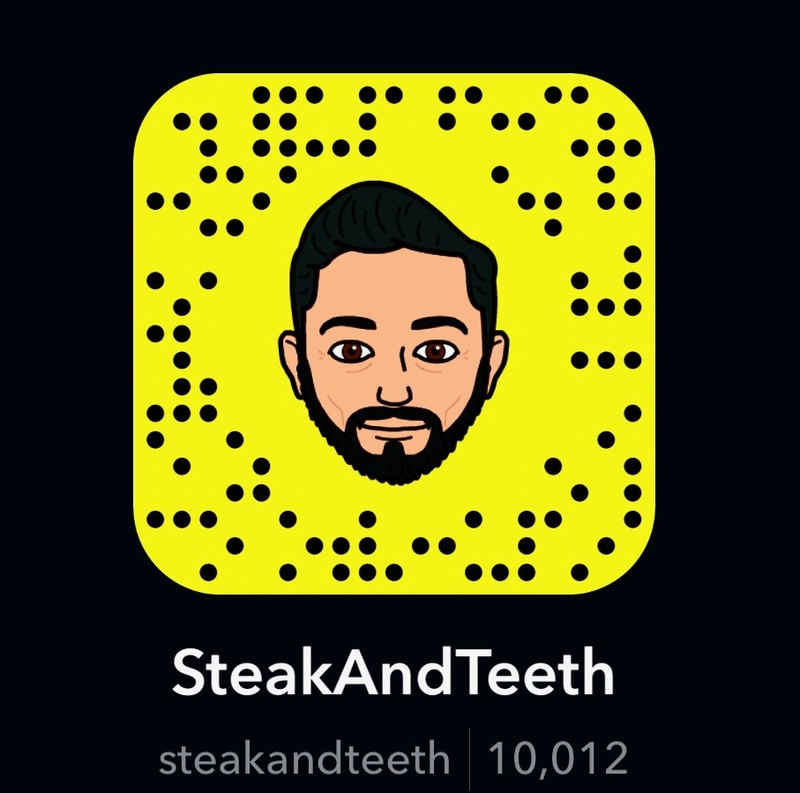 Despite the general indifference I felt towards my meal, Steak and Co did just about well enough for me to be willing to give it a second go, and it’s certainly worth a try if you’ve never been.